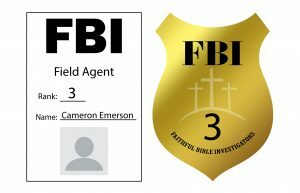 The Duncan Park Baptist Church F.B.I. (Faithful Bible Investigators) program is for boys and girls age 3 through the 6th grade. Clubs meet every Wednesday night (Sept – May) at 6:30pm. Our goal is to introduce them to the Bible and thereby the God of the Bible and how they can develop and begin a personal relationship with Him through the “Good News” that is contained in this wonderful and unique book. The program is designed around a “Federal Bureau of Investigation” motif. The children are taught how to use critical thinking to investigate and form conclusions about the people and events in a book that claims to contain the very words of God Himself. By doing so the children become Agents. As they move through the rank structure their knowledge of the Bible will grow and they will receive incentives to “rank up” and receive new badges that reflect their achievements. Obedience to God and His Word the Bible. Accepting responsibility and consequences for my actions and decisions.